I eat big salads every day. I love kale salad, but only seem to make it when I am out of lettuce. It’s so good, I should make it more often. This is a great salad to prepare in advance and bring to a potluck or picnic. 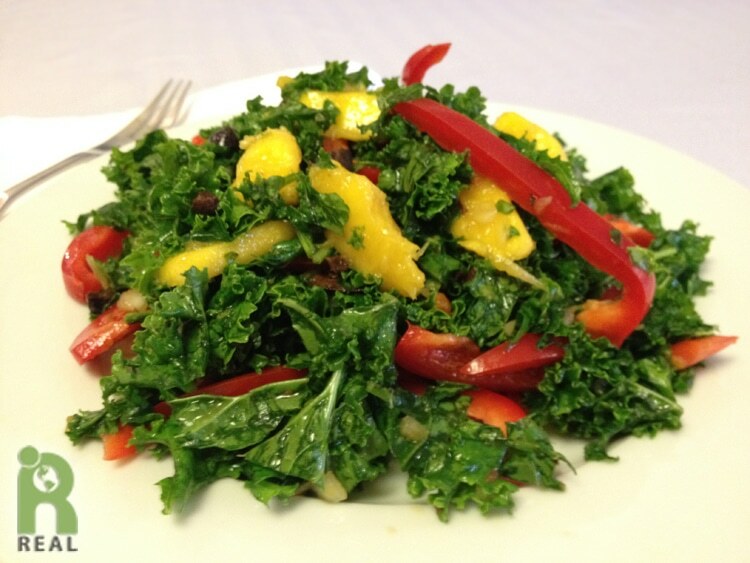 Unlike salads made with lettuce that will wilt very quickly once dressed, kale salad can last several days. Remove the stalk from the kale by cutting or ripping the leaves off. Save the stalks for a green juice. Roll the leaves and cut in thin thread about 1/4 inch to 1/2 inch thick. Place in a bowl, pour in the orange juice and knead the leaves with your hands for a few minutes. This will soften them. Add in the peppers, mango, olives and onion. Toss and serve. Serves 2-3 as a main dish or 4-6 as a side salad. Variation: Add in 2 fresh tomatoes, chopped, in place of bell peppers. Add one avocado, peeled and cut into small pieces in place of the mango. Looks great! I love Kale.